Since it’s launch on Oct 5, 2015, you’ve helped Accelerate! become the go-to resource for insightful, educational, motivational and entertaining interviews with world-class experts on a range of subjects that all contribute to helping you accelerate the growth of your sales and your business. 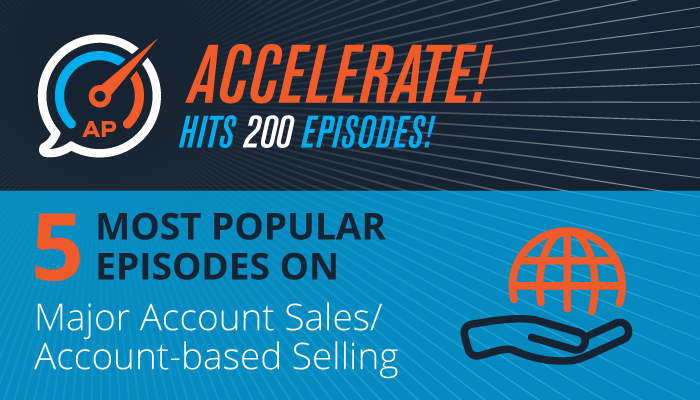 I’m marking this milestone by highlighting the most popular shows from my first 200 episodes on Accelerate! Listen to the world-class experts on these episodes and I guarantee that you’ll learn something new to help you become a more productive major account sales pro. The episodes are listed below in order of popularity. Richard Ruff is a top sales trainer and leading expert on major account selling. He is the author of Mastering Major Account Selling and the co-author, with Neil Rackham of the book Managing Major Sales. In this episode we tackle the importance of integrating Account Based Selling into your sales process. Barbara Weaver Smith, is the Founder and CEO of The Whale Hunters. She is also the co-author of the classic, best-selling book Whale Hunting: How to Land Big Sales and Transform Your Company. In this show, Barbara and I discuss the keys to winning orders from major account customers, otherwise known as “whales,” that will accelerate the growth of your sales. Tom Searcy is the author of the book, Life After the Death of Selling: How to Thrive in the New Era of Sales. He is also co-author of the book, Whale Hunting: How to Land the Big Sales and Transform Your Company. In this episode, Tom and I discuss how small businesses have to change how they think and act to compete with larger companies for bigger deals. In this episode, David Brock, founder and CEO of Partners in Excellence, discusses how modern sales reps need to transform from being a reactive, tactical seller into a proactive, strategic seller that possesses the insights and expertise to inspire customers to make a change. Tim Sanders, is the author of four books, including the New York Times bestseller Love Is the Killer App: How to Win Business & Influence Friends and his new book: Dealstorming: The Secret Weapon That Can Solve Your Toughest Sales Challenges. For the past decade Tim has been consulting with B2B companies on how to improve their ability to get unstuck due to the Dealstorming process he created. In this episode, Tim and I discuss how you can use Dealstorming to help you close orders with important accounts.